HOW DO WE FIGHT NATURE-BLINDNESS? This is the story of teenagers walking along our beautiful coast-line, so distracted by other things that they missed an amazing natural scene of a dolphin giving birth. It is not just the young, it is all of us who can be blind to the wonders of the natural world. So how do we fight natural blindness? Not long ago, from a vantage point on a high bluff above a shoreline, Carol Birrell watched a group of high school students as they hiked through a park that was bordered on one side by a bay of the blue Pacific and on the other by a subtropical ecosystem. ​Birrell, who teaches nature education at the Centre for Education Research, University of Western Sydney, described the scene: “All had their heads lowered and backs bent with eyes focused on their feet like blinkered horses.” The scene also reminded her of how children walk along fixated on their cell phone screens. 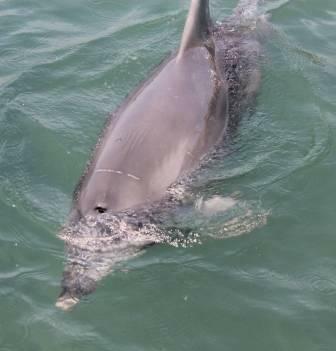 Not more than 100 meters from the hikers, in the bay, a dolphin was slowly circled by three other dolphins. They were splashing loudly. And then it happened. ​The students never saw it. They had walked right past this once-in-a lifetime event without looking up. ​Surely many other people on such an outing would have turned and looked. But in an increasingly distracting, virtual environment, many of us spend as much or more time blocking out our senses than using and growing them. ​“What are all of us missing out on when we rush through the bush, rush through life?” Birrell wonders. Australians (who live in the world’s most urbanized nation), like Americans, are experiencing what I’ve called nature-deficit disorder. That’s not a medical diagnosis, but a metaphor. ​In both countries, physical activity is decreasing and screen-based activity is increasing. The pace of that change increases as children get older, according to the Australian Bureau of Statistics. One in ten children today play outside once a week or less, and nearly one in four parents say their children have never climbed a tree, according to Australia’s Planet Ark. ​In 2007-08 the ABS National Health Survey found that one-quarter of Australian children ages 5 to 17 years were either overweight or obese. This proportion has remained stable with updated results from the 2011-12 ABS Australian Health Survey. In Sydney, researchers found that 12-year-olds with the highest levels of close-up work activity and lowest levels of outdoor activity were two to three times more likely than their peers to develop myopia. ​We also know more about the up-side of nature experience, specifically. ​Research around the world indicates a correlation between time spent in nature with reduced symptoms of ADHD and depression, and improved mental cognition and creativity. ​​​Public awareness about such benefits is spreading. Across Australia and several other countries a multitude of inspiring campaigns and programs is springing up. Paediatricians are beginning to prescribe nature. Urban planners are once again considering the nurturing of nature-rich neighbourhoods as a way to prevent disease and restore health. Conservationists are viewing urban regions as potential engines of biodiversity. ​Now comes a new nature movement to connect children, families and communities to nature. Momentum is growing. We see it in the new vigor of organizations around the world that have worked for years to achieve that goal. We see it the hundreds of new regional campaigns — including the major Nature Play initiatives spreading across Australia’s states. ​As a species, our responsibility to care for the natural world, and our hope to help grow new natural habitat, will be linked to a worldwide realization of that human right. ​A few words of caution. Without an even stronger worldwide movement, concern could fade. More and even better research — causal, not only correlative — is needed. So are new, creative ways to connect children to the natural world through nature education, but also through direct, unorganized experience. ​As Carol Birrell’s story suggests, you can lead young people to water, but without a deeper understanding of the wonder of nature, without the joy of it, you cannot make them see. Richard Louv is the author of “The Nature Principle” and “Last Child in the Woods: Saving Our Children from Nature-Deficit Disorder.” He is also Chairman Emeritus of the Children & Nature Network.